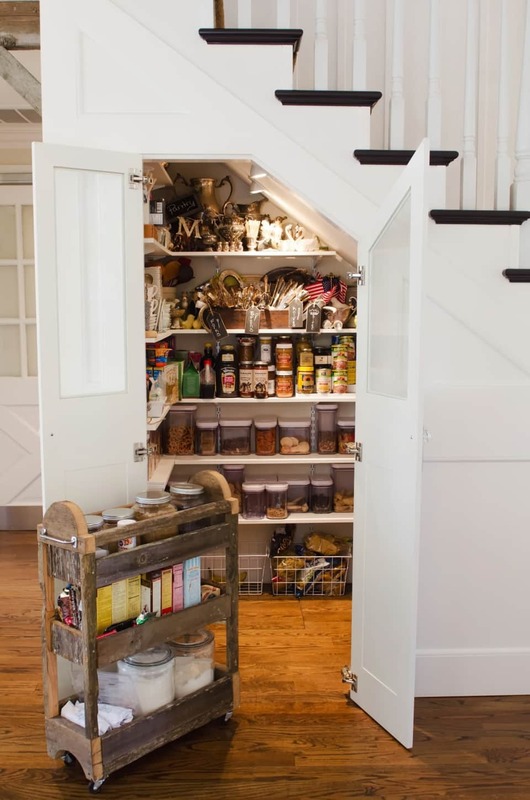 In need of some food storage ideas for tight spaces? If you’re worried about your lack of food storage, this list is sure to help open your mind to all the possibilities! Here’s how you can store all the food you need (and more) in such close quarters. I can still remember back when we didn’t have our farm. My husband and I were just starting out, and boy, was our home small. I was trying to be self-sufficient and had almost given up on our food storage situation since there never seemed to be enough space. Luckily, we were able to get by, and since then space has never been an issue. Whether your home is small by choice (tiny houses are all the rage), or if you’ve just moved into your first home and need to make the most of it, you’ll love these good housekeeping tips for storing food in small spaces. Vacuum sealing your food will help store it minus the bulk of bins, jars or boxes; it’s also a great way to make your food last longer. Need garlic, mushrooms or other veggies for your recipes? Similar to vacuum sealing, dehydrating your food will save space and help your food last longer! Canning has always been one of my favorite methods of preserving food, all you’ll need is 13 steps to complete the process. Canning allows food to last for months, even years. Store your cans in harder to reach places like the back of the cabinet or underneath the house. You won’t have to worry about food spoiling, and you can go get it when you do end up needing it. To keep the drawers more organized you can put up dividers and store them diagonally by size. This helps you stay organized and find the tools you need while making the most of every inch and corner of your kitchen. This thin little cabinet is a dream come true for small homes! It slides out of a wasted space and is only 6 inches wide. A great addition to a home that has extra room next to its fridge, or other bulky appliances. There is no wrong place to hide food when you have a small house. If you have any space under the bed you better be using it! Add a little personal touch to your condiment storage. Having items that aren’t just practical but also convenient are what make your house a home. Add more spice to your life by tweaking your cabinet door with a little extra storage. All you need is a metal panel, magnets, and metal spice jars to get the job done for this cabinet door food storage. This is not only cool to look at but incredibly helpful as well! What a way to make use of the empty wall space? If you’re lucky enough to have a staircase in your small home, maximizing the space underneath it is always a good idea. Mason jars are perfect for almost anything. Try this organization hack and make use of the space underneath your cabinets. Is it furniture or your food storage? Hit two birds with one stone with this DIY. You can line up your storage items and put a nice decorative fabric over them so it’s easier on the eyes. It might not be the most aesthetically pleasing, but it sure is practical, and sometimes that’s all that matters when it comes down to survival and having enough food in the homestead to last through winter. What do you think? With a bit of creativity, almost everyone can find a little extra space even with tiniest space available. Just because you are living in a small space it doesn’t mean you have to think small. I hope these ideas have sparked a bit of inspiration on how to make your space work for you! Which food storage idea will you try in your home? Are we missing any? Let us know below in the comments! Want more extra space storage ideas? You’ll never run out with these 160+ extra space storage ideas to make your space a bit more functional! This post was originally published in March 2016 and has been updated for quality and relevancy.